Texas A&M AgriLife Extension Service will hold two workshop April 15 in Portland. 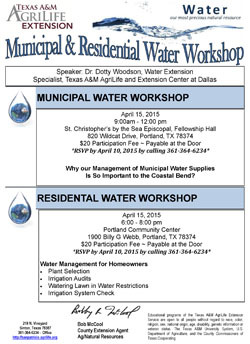 The featured speaker will be Dr. Dotty Woodson, water extension specialist at the Dallas AgriLife Center. The first session will deal with the importance of management of municipal water systems in the Coastal Bend. It will be from 9 a.m. to to noon at St. Christopher's by the Sea Episcopal Fellowship Hall, 820 Wildcat Dr.
A $20 participation fee is payable at the door. RSVP by April 10th by calling 361-364-6234. A second session will deal with water management for homeowners including landscape plant selection, irrigation audits, watering lawns under water use restrictions, and irrigation system checks. It will be held from 6 p.m. to 8 p.m. at the Portland Community Center, 1900 Billy G. Webb Dr.